World In Flames, A Different Breed, Icepick Lunatic. These are the HowManyDevils songs that got some more drums today. Who played drums? Me. Whose fault is it? Mine. I’m not a drummer… There’s a tom fill that I can do pretty well now, and I’m pretty close to being in time. Not really selling you on it there though am I? Intensive editing will happen and you’ll think the drums were played by a professional. We have got a much tighter drum sound out of this session though. How? 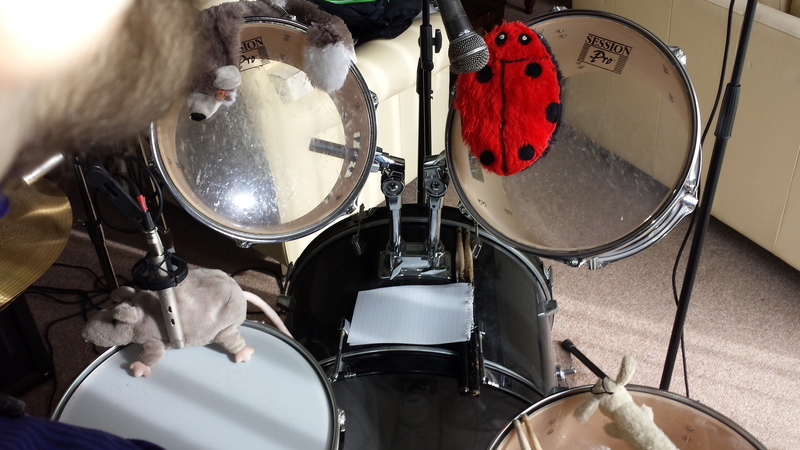 By covering the drums with plushy dog toys. This entry was posted in Flesh Reunion and tagged A Different Breed, Album, drums, Flesh Reunion, Flesh Reunion 19, HMD, HowManyDevils, Icepick Lunatic, Pete, recording, Rob, Simon, World In Flames. Bookmark the permalink.